We all know what happens to that network marketing evangelist at the party who sees every guest as a sales opportunity and pounces to sign them up for some or other scheme within minutes of ‘hello’. Few people like to be seen as sales prospects or consider meeting someone as synonymous with having a relationship. Instead, we bide our time and politely sneak off to find someone interesting to talk to. “What a user,” we think, as we walk away. Likewise, on social media, a connection is not just a measure in the ‘cost-per-lead’ or ‘lead-to close’ ratio. Connecting does not give you permission to spam automatic direct mails, free eBooks or worse, a request to brief on a product totally unrelated to their business. Yet time and again, this is what happens on social media. A business sets up a boring, broadcast Twitter stream run by a logo, or a collection of special offer links masquerading as a Facebook page then whips out calculator and concludes that there’s little value or ROI. Who were their customers? What did they want? What did they share that was helpful? How many complaints were resolved or prevented from becoming complaints in the first place? They can’t say because they didn’t realize those customers had names or that social was for speaking to them. Don’t get me wrong, metrics are important, but leading with a metric is the dinner guest who concludes that a night is a waste because no one signed up to sell cleaning products; instead of asking questions, exploring shared interests and thinking about how to contribute something helpful without wanting anything in return. This kind of thinking is particularly unhelpful when organizations are determining whether to invest in building social media channels or ‘allow’ the CEO to use them, a term I find particularly amusing as it suggests that a wo/man with the wherewithal to make strategic decisions that impact thousands may not have the wherewithal to tweet. That is not the point, but it’s the kind of mindset that emerges when social is seen as transactional. A minute of the CEO’s time is costly for handling a customer complaint but it’s cheap when you consider that a social media platform gives you the power for big think, to shape narrative, share a company’s story, build communities and engage with customers, suppliers and employees directly and connect serendipitously across disciplines, business interests, languages and borders with people who influence thinking and ideas. When in the past could a company reach millions of people every day without investing huge dollars in advertisements or lobbying powerful media interests to give them airplay? Transactional thinking also leads to some pretty stupid questions. One such question – how often should you tweet? Once, twice, 8, 15 times a day? We dive into the data to measure, what? Impressions? Retweets? Engagement? Conversion? General guidelines like show up, listen, don’t interrupt or blurt everything out in one go are helpful in real and social life. But no one asks how many words you intend to use in meeting. Social is a conversation. You may say nothing but if there’s a game changing impact on the business it may be hard to hold you back. It’s possible to measure the contribution of relationships to business and of social media to relationships, but it’s pointless to stop the clock at 10.01 am, 10.02am and 10.03am to measure whether ‘if’, ‘and’ or ‘but’ garnered more impressions. The data captured at that point in time, albeit data, may tell you nothing. Overall impacts within the context of business strategy count. Be part of a global brain. Why do you exist? Whether you sell superannuation or are driven to end anonymous shelf companies, social media is an opportunity to create and curate content (blogs, LinkedIn posts, tweets, magazines, podcasts, photos, videos, live streams, playlists) and share them with millions of people, creating hundreds of thousands of signals over time about who you are and what you stand for. It influences how you are found and what people find when they search for you. For leaders, talking about what’s on the horizon or the broader issues that influence decision-making flags the quality of leadership driving the organization, that you’re aware of cutting-edge advances that could blow you out of the water or care about the environment enough to divest. This applies to individuals as much as business leaders. For example, writers know that even if every tweet they sent converted to a sale they’d still be unlikely to make a living off books, so being social is not underpinned by a financial imperative. However, being on social media allows them to share with a global audience. Visibility leads to speaking or consulting opportunities but also provides a platform to talk about issues that are meaningful to them, whether that’s science, medicine, creativity, politics or social justice. It’s great stumbling on a favorite author and talking to them about their work, usually it’s reciprocal. Reading communities come together online. I now get almost all my book recommendations off social and have come to know and enjoy new authors but also the people who recommended them, many of whom I’ve befriended offline. Yes, there are opportunities to capture fans on Twitter lists or mailing lists and create warm leads when the next book comes out, but that’s just a part of it. People act on issues that are directly relevant to them and where there is something specific that they can do to achieve an outcome. If there’s a pre-established context with little connection between themselves and an issue, there is no cause to act. Let’s take the recent example of the Panama Papers. People tend to think ‘white collar crime’ as if it’s about private jets and tax havens and don’t see the insidious impact on daily life or their community or the connection to crime more broadly. Make those tools shareable so they can ask others on your behalf. That means translating stories, statistics or facts into concrete impacts and calls to action, while continuing to have a nuanced discussion in which the proper use of power, acquired wealth and legitimate industry do not become confused with corruption. Curated and created content combined with a social platform enables that. Health care professionals aren’t on Twitter to solicit patients; they already have enough patients. But being on Twitter connects them with like-minded peers in various disciplines where they can debate issues that impact healthcare, exchange research, dispel misinformation and share learnings and resources with one another. 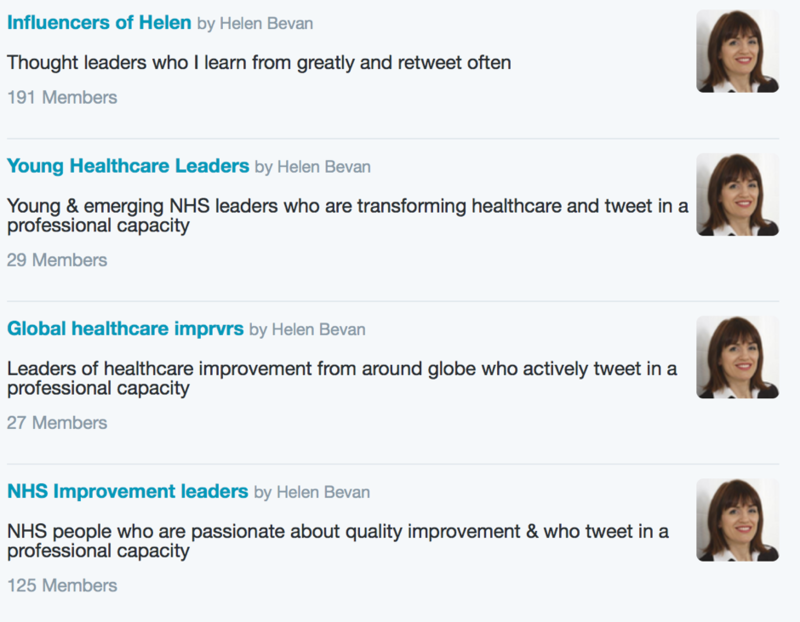 Chief Transformation Officer at NHS Horizons Group, Helen Bevan, whose Twitter biography reads ‘often sees the magic that happens when people come together with a common purpose in health & care’ makes her well-curated lists of healthcare movers and shakers publicly available for anyone who wants to use them. An individual can’t keep up with the amount of information published but collectively we have a huge pool of knowledge. Online others jump in with links to research or case studies that raise overall levels of understanding about a topic. The week that LIGO discovered gravitational waves #einsteinwasright trended, the hashtag led me to Matt Pitkin on Twitter and hence his blog where he gave an informed but accessible account, as well as to a video on TED, which I’m happy to see is producing high quality content in real time in relation to world events. We saw this same virtuous cycle of social-driven content with the #panamapapers where almost instantaneously you could acess news on Twitter, live video in the Facebook feed, every form of traditional media and other forums like Global Witness on TED. I can’t tell you the number of times that I’ve reached out with a question or been chatting when others have generously and without expecting anything in return, connected me with people or information that has significantly impacted on and improved my thinking. Of course social-driven-content can coalesce around lighthearted topics or even destructive ones but most technologies can be used for good or bad, that’s not new. Despite this, I find that as soon as metrics are mentioned, everyone in the room coughs and settles down as if we’re now finally getting into the serious part of the conversation. Like any area of business, marketers measure and report on results, that’s appropriate. While parts of the chain are easy to quantify, relationships do not yield as easily to numbers. Specialists have widely divergent views on the best ways to quantify ROI but importantly, whatever the measure, when it comes to social media strong, engaged relationships must be established first. Gary Vaynerchuk, for example, is a content sharing machine giving great information through Twitter, Facebook, Instagram, Snapchat, podcasts and online TV and has recently been able to harness a global crew of advocates to promote his book for him. Bestseller. In Australia firms like Pod Legal and Firebrand Talent share high quality, educative content and connect people they think could benefit from knowing one another are always being hat-tipped and recommended, this has worked for them. My book deal came through Twitter and I recently landed a consulting gig with a large client because from LinkedIn piece I’d written on the impact of social media on investment. The bottom line is vital to business and we need to recognize that results that come via relationships aren’t point-in-time transactions. The non-numbers side of social can provide a greater contribution to the numbers over the long haul. This entry was posted in Social media and tagged connection, linkedin, marketing, metrics, relationships, ROI, transactional, Twitter. Bookmark the permalink.